GTPD prioritized its social media presence in early 2016, and it has been growing rapidly since. Beginning with one sworn police officer and one student employee, it has developed into a dedicated, physical Social Media Center with a full-time officer and nine student Social Media Reporter employees. The GTPD Social Media team works collectively to continually update posts and monitor critical public activity on the eight social media platforms most popular with Georgia Tech students: Facebook, Instagram, Twitter, Snapchat, YouTube, and Reddit. Stories ideas and posts are developed, formed into appropriate messaging, and forwarded up the chain of command to be reviewed and ultimately posted. Another critical task is the reporting of posts that reflect a student's desire for self-harm or posts that use other alarming language; these posts are identified for possible intervention by a patrol officer. Safety tips for back-to-school activities, a local boil water alert, traffic accidents, and correction of misinformation are just some examples of content developed by the Social Media Reporters. Through these prominent smartphone and web applications, the Department can help keep the campus community well-informed by nearly instantaneous means. Not only does this contribute to public safety, but the comment feature on most platforms enables the public to communicate back to GTPD officers critical information such as tips on illegal activity, and timely community concerns. The GTPD Social Media Center’s posts and profiles have generated an enthusiastic and growing following by Georgia Tech students. An added benefit of the Social Media Center activities is the humanization of the police force. By profiling different officers, the program helps to put friendly faces on the Department and its work, enabling the entire campus community to more easily connect and converse with the officers who are sworn to protect them. The students’ positive responses to this aspect have confirmed the value of the Department's social media initiatives. 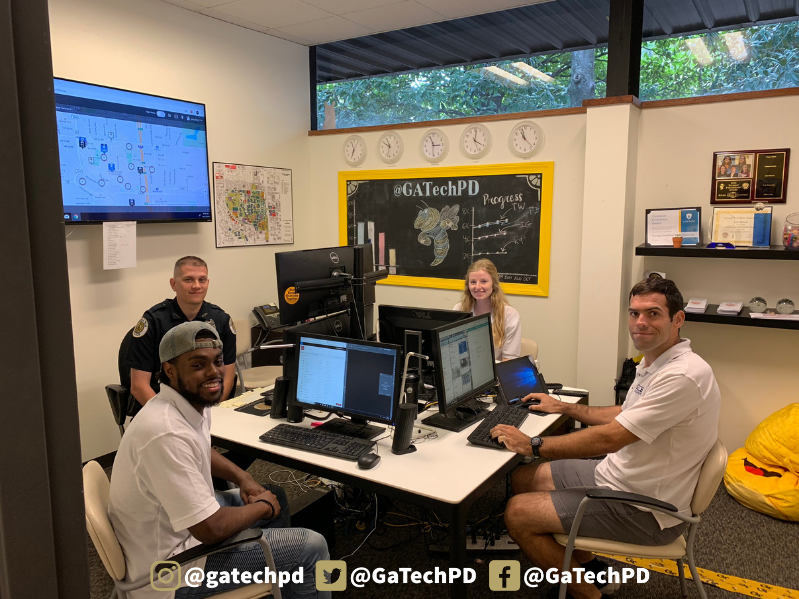 During emergencies, the Social Media Center works closely with GTPD command staff, the GTPD Office of Emergency Preparedness and Georgia Tech Institute Communications to ensure that accurate information is disseminated on a variety of social media platforms.